Pensacola State also was named a 2018 Gold Medal Chapter of Distinction, and culinary arts Instructor Jimmie Langham received the Florida SkillsUSA Advisor of The Year award. 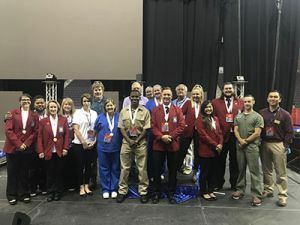 Hosted by Pensacola State, the 2018 Florida SkillsUSA State Leadership and Skills Conference was held April 30 and May 1 and brought more than 6,000 visitors to the Pensacola area for the event and Worlds of Possibilities Career Expo and Job Fair. Pensacola State students won gold medals in nine categories, silver medals in three and bronze medals in two. Gold medal winners automatically advance to the 54th annual National Leadership and Skills Conference scheduled for June 25-29 in Louisville, Kentucky.